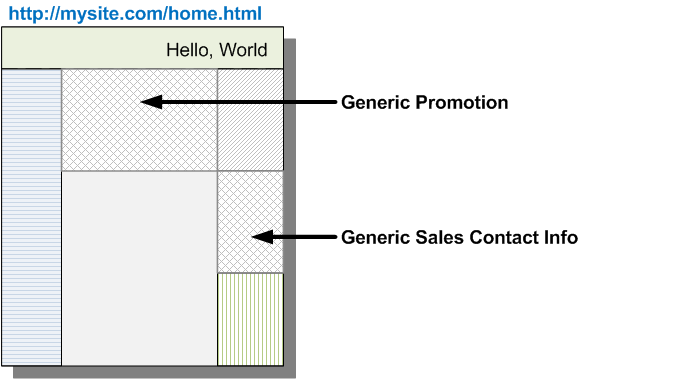 oshyn Blog: WCM Design Pattern: Atomic Asynchronous Personalization and Enhancement - Open Text Web Solutions Usergroup e.V. 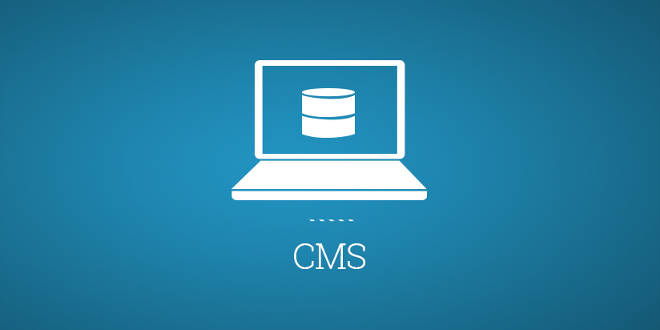 Personalization is the enemy of caching, as the folks at CMS Watch are fond of saying. 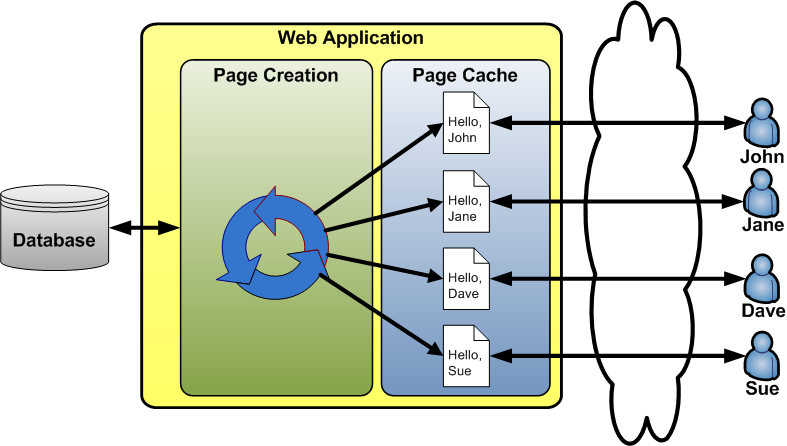 Because caching is an essential ingredient to the performance and scalability of a Web application, a simple touch of personalization such as “Hello John” can have devastating impacts to a site. Considered the “Hello, World” example below. In a WCM environment, a page is generally created by pulling content data from a database (or other content repository), then applying those data to one or more templates to render the desired output, usually HTML. With a generic page, the page can be created once, cached, and reused for each user visiting the site. In contrast, once personalized content is introduced into the page, the same version of the page cannot be reused for all site users. The page must be recreated for each visitor. See the illustration below. Depending on the prevalence of personalization on a site, the additional processing load to reproduce the same page for each user can be huge, decreasing the performance and capacity of a site by orders of magnitude. 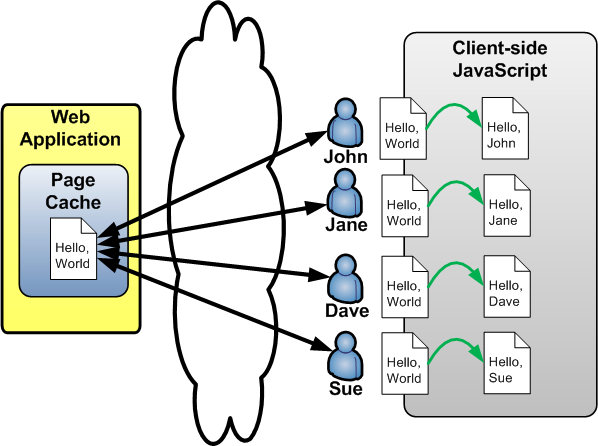 The inherent incompatibility of personalization and caching can be mitigated to a large degree by the introduction of Atomic Asynchronous Personalization and Enhancement (AAPE). The basic principle is fairly simple: serve a generic (cacheable) version of a page to all visitors, then use AJAX and Progressive Enhancement to add personalization after page load. In some cases, personalized content is not available at login or isn’t suitable for being stored in a cookie. In these cases, the content can be pulled by the client using AJAX. Usually, this content is confined to targeted regions of a page and tailored to a specific user segment. 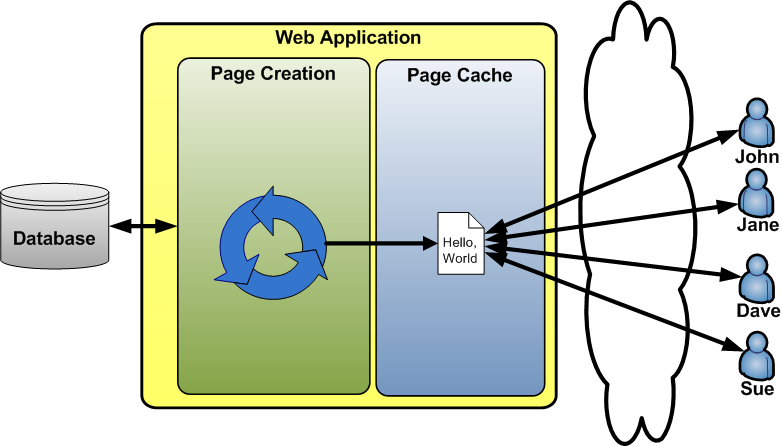 By breaking out these page fragments into more granular (atomic) components, they can be retrieved asynchronously and incorporated into the page, and in many cases the components themselves can be stored in a page cache for later reuse. To accomplish asynchronous personalization for this page, the first step is creating a generic (cacheable) version of the page. Because each atomic unit has its own URL, it can be stored in the page cache and reused for all users in the same user segment.